In total, 22,701 people downloaded a copy of the book – that’s Twenty-two thousand, seven-hundred and one for those who prefer text to figures. I rose as high as no.9 overall in the Amazon.com free charts, and held onto the coveted no.1 spot overall on Amazon.co.uk for most of the day! I’m over the moon. Obviously! Which is why I’d decided to write this post, thanking everyone who helped me to spread the word, and helped made this day the incredible trip that it was. 'That Bear Ate My Pants!' 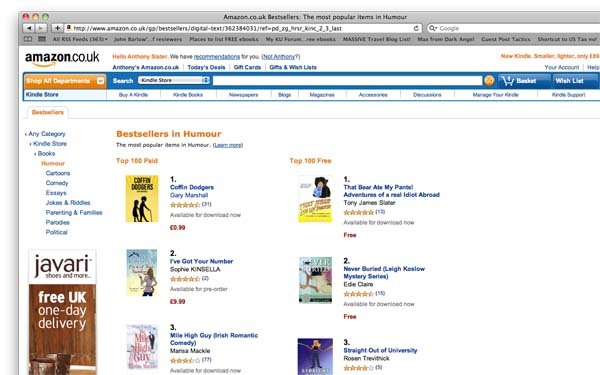 at No.1 in humour! I took dozens of them! But this one, showing me at the top of the ‘humor’ category in Amazon.com – the world’s biggest bookshop – just blew my mind. A MASSIVE THANK-YOU to everyone who mentioned, re-tweeted and followed me over the two days. Messages were flying back and forth, so it didn’t occur to me ‘till after it was all over to do a search for ‘That Bear Ate My Pants’ – and there were hundreds of Tweets in that list, all from people who don’t even know me on Twitter! @DavinaPearson (Davina Pearson) – Nomad! @Flickimp (Imran Siddiq) – Nomad! Please share the love by following these awesome people! I’d like to say a specific thank-you to ‘Joo’, a reviewer and active member of the UK Kindle Forums, for being a one-woman promo army! If you’re about to do a free day and you need the world to know – THIS is who you’re gonna call! Legend Tony! So stoked for you! Well done my crazy Pommy (now ozzie!) friend! Thank you, Tony. Good luck with your next book. Congrats on your success. Thanks for submitting, and we look forward to having you back when you write your next book. Oh, I’ll be there Jack! Indie Books List was instrumental in propelling me up that free list, and it’s getting up there that is helping me now – when the sales actually bring in money! Thanks so much, and I’ll be sure to mention Indie Books List whenever I can! Thanks for the mention buddy. You’re a true star and deserve all the success that comes your way! All the very best with it all. I’ll get a review up as soon as I’ve read it too. Thank you for the thank you, pal – so much fun to watch it all happen! No worries Steven! Hope I get chance to return the favour at some point! Glad to see it worked so well and thanks to mentioning all who helped. I followed over from Lets Get Digital blog post. Congrats. Thanks for the shout-out on promo day – I think I still owe you an interview! What a success it was… thanks again mate. Couldn’t have done it without ya! Congratulations! This is amazing. When my mystery/suspense novel hit #44 I thought I was going to have a heart attack! What a great feeling. Wish you tons of continued success and thanks for sharing. Hi Pam! Yeah, it’s the best feeling in the world, eh! I love so many things about rising up the charts – it’s exciting in itself, and I have a competitive streak so I love to see the numbers improving! But best of all, it means people are reading my work! And they must be telling their friends about it too, as I’ve not tumbled back into obscurity just yet… Great news! Mystery/suspense has a much bigger market than my kind of books, so the competition must be much harder – I’m no.1 in my category, but then how many books really are there in Travel/Latin America/Ecuador??! Not more than about 30 I imagine! I just popped over here as I was talking to my father-in-law about your book as he’s 2/3 through it and enjoying it and I saw your lovely thank you. So thank you for thanking me for thanking you for writing a fab story. Yeah, you did me a real favour (or a series of them) with all your promotion, posting messages on the other forum and generally spreading the word. That’s so great! I have no way of measuring what effected what and had what results, but I can be sure that without you flying my flag during the free promotion I wouldn’t have got as many downloads as I did – meaning I wouldn’t have got the rank I did, which led to the visibility which led to more downloads… and eventually sales! So, once again, from the bottom of my heart – THANK-YOU JOO!!! Ps. I LOVE Animal Planet! I love all the Nat. Geo. channels (I’m an obsessive documentary watcher), but you can’t beat the natural world in HD! Congrats, bro. Your a cool guy you deserve it. I’ll follow those Tweeps. Cheers mate! Yeah, EVERYONE should follow those folks! They’ve been so good to me, I reckon anyone would benefit from making friends with these individuals. But treat ’em nice, eh! Thank you so much for all this ‘leg’ work! And for posting it? Absolutely Awesome!